By Robin Kobaly | We are witness to assaults on our desert landscape every day, but we usually recognize only what we see above ground. In fact, these surface alterations result in critical changes below ground that have far-reaching implications that are mostly unnoticed or unappreciated. If we could see the intricate systems that hum along invisibly underground, we would likely fight even harder to protect our desert landscapes from unnecessary disturbance. Research around the world is showing that the biggest contributors to soil stability in deserts are the smallest of microorganisms. Tiny microbes hold our desert landscape together. The valuable role of hidden microorganisms in keeping our air cleaner, preventing dust storms, controlling erosion, and helping us reduce carbon dioxide levels in our atmosphere is enormous, but that role is mostly overlooked when we make land-use decisions in our desert. Across arid soils, a thin crust often forms within the top few centimeters of the soil surface. Surprisingly, these crusts are not exclusively formed from excess minerals, as is often thought, but are created by microscopic and somewhat larger macroscopic organisms that live together in a tiny but profound world. Whenever it rains, a cast of soil creatures (including cyanobacteria, formerly called blue-green algae, plus bacteria, fungi, and other microbes) that have been patiently sleeping wakes up like a scene in Sleeping Beauty’s castle. Released from the spell of drought, these microscopic creatures start making food and creating miniature subway tunnels as they move through the soil, reproducing as long as the soil is moist. Tunnels of sticky mucilage around algae filaments allow the algae to move into new frontiers while moisture paves their way. As the soil dries out after rain, a slumber again falls over the entire community, and the soft, gluey tunnels start to dry out – but not before tightly binding all the soil grains they have touched. The value of this thin, living “skin” across our desert soil is not only expressed during its wet “waking hours,” but also during its dry dormant time when it performs the critical role of gluing soil particles together against wind and water erosion. During the following months or years of drought, these sticky tunnels continue to bind soil grains together. The result of this microscopic community is a protective seal across the soil surface called a biological soil crust that keeps dust, particulate matter (PM10s and PM2.5s), and harmful fungal spores like valley fever from being blown up into the air wherever soil has not been disturbed. These living soil crusts take hundreds of years to develop into effective soil sealants, but when they are allowed to remain intact, they not only hold back wind and water erosion, but also supply nutrients to neighboring higher plants, improve water infiltration, prevent choking dust storms, and help keep our air clean and healthy. Plus, they do all this for us while they are sleeping. Working both above and below this marvelous crust, plants are breathing in massive amounts of carbon dioxide from the air, reassembling the carbon into sugar, then transporting it underground to grow roots. Byproducts from this growth (photosynthesis) become locked in hidden carbon storage vaults underground, both living and non-living, for many hundreds of years. Small shrubs like Blackbrush can live at least 400 years, while Mormon Tea can live over 250 years. Our Mojave Yuccas are youngsters at 500 years old, and may live to several thousand years old. And even more impressive are Nolinas, Desert Ironwood trees, and California junipers that may live to over 1000 years. Roots from these carbon-eating plants reach far underground, some as much as 150 feet deep (roots of succulents like cacti and yuccas are not as deep; they have other survival tricks). Roots this deep are essential to reach soils still moist from rains that may have fallen many years ago, and these deep, living “straws” create an upside-down forest of craggy wood, resulting in a greater mass of living tissue below ground than what we see above ground. All these deep roots are not separate and alone in their quest to gather water and nutrients to survive. 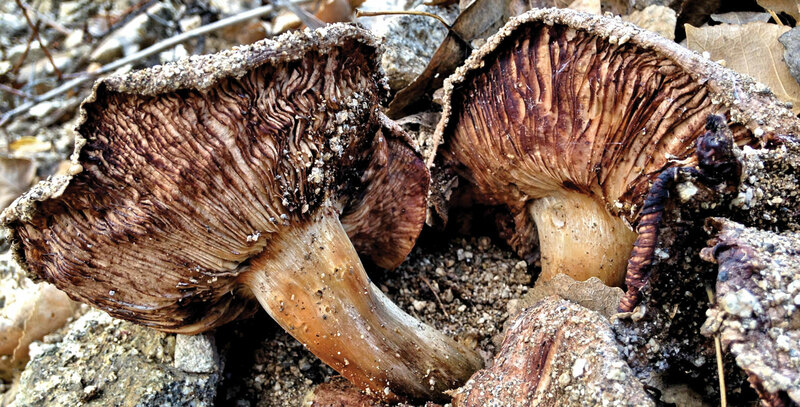 Eons ago, they struck upon a partnership with fungus that helps them absorb moisture and nutrients from an arid soil that is almost devoid of either. Over 90% of plants on earth belong to this “root partners’ club,” a lifelong membership that grants participating plants special privileges. But the fungal partner offers more to this relationship; it offers immune-boosting compounds and antibiotics, and bitter-tasting chemicals that deter animals and insects from eating its host’s leaves. Even more mind-boggling, fungal threads from neighboring plants can merge with adjacent fungal threads to connect plant to plant in a massive community network that “exchanges information” between plants for the good of the whole community. The benefits of this hidden relationship extend beyond the exchange of resources between plants and fungi. Both the root and the fungus are breathing out carbon dioxide in the dark (plants breathe incarbon in the light, and breathe outcarbon in the dark). Right at the point where a tiny fungal thread connects to the plant root, some of the carbon dioxide exhaled by roots and fungi reacts with calcium in the soil to form crystals of calcium carbonate, or what is called caliche. Carbon in these crystals becomes locked into the soil. Over time, large chunks or even vast layers of caliche are built up underground, capturing carbon from our atmosphere in an underground lock-box and reducing its potential escape into the atmosphere. This transfer of carbon from air to leaf to root to fungal partner and into caliche deposits is one of nature’s ways to sequester carbon and hold it in natural storage underground. All that we need to do to keep the carbon safely stored in the underground caliche is to allow the desert plants to keep living and sequestering carbon. It is thought that some of the vast caliche beds in our southwest desert soils may have been formed over thousands of years. Some of our longest-lived desert plants may have germinated right after the last ice age receded 10,000 years ago and are still growing today, capturing carbon underground over millennia (King Clone, a cloning creosote in Johnson Valley, estimated to be almost 11,000 years old, is one example). There is still more to this incredible story. Every hyphae (the thread-like “root” of a fungus) of the most common kind of root-partnering fungus in our desert (arbuscular mycorrhizal fungi) is coated with a waterproof sealant called “glomalin.” This coating of sticky protein around each fungal thread prevents leakage when water and nutrients move through the hyphae. Glomalin is made directly from carbon gathered by its plant partner, so again atmospheric carbon is being moved from air into soil for long-term storage. Remarkably, each hyphae’s coating of glomalinpersists in the soil after the fungal thread dies (when the growing root section matures and barks over). For another 30 to 100 years, the sloughed off glomalin glues soil grains together in packets containing carbon, nitrogen, phosphorus, and other valuable nutrients. This waxy coating of glomalin helps to form tiny soil clumps called “aggregates,” and prevents nutrients vital to plant growth from being leached out of the soil. Glomalin will continue to hold carbon underground long after death of the hyphae that produced it – helping us in our quest to reduce greenhouse gases in our atmosphere. This entire kingdom of incredible creatures works twenty-four hours a day, year after year, without any input from humans, unseen by us and mostly unappreciated by us. These life-forms in mutual partnership will continue to glue our soils together and capture our excess carbon in perpetuity . . . unless we remove the plants and disturb the soil that makes all this magic work. We are now faced with decisions about whether to allow thousands of acres of functioning desert systems to be sacrificed for solar energy developments – on the premise of reducing carbon dioxide levels in the atmosphere. Scientists estimate that after the removal of desert vegetation and disturbance of the top soil, the pre-existing plant community requires about fifty to three hundred years before it returns to pre-disturbance cover and biomass, but requires about three thousand years before the disturbed area returns to the function it had before disturbance. The ancient nature of both the plants and the living soil crust organisms make this a credible prediction. Wherever possible, we need to steer developments, especially large-scale projects like utility-scale solar facilities, to pre-disturbed, severely impacted soils or pre-developed sites such as parking lots and roofs. Then, we get the best of all options: progress with preservation. Leave these microscopic soil magicians alone to do their work. The desert’s underground life-support systems can only function if the aboveground systems (desert plants and living soil crusts) are kept alive and intact. We must be their voice and their champion in protecting them – so they can silently continue to protect our potential for carbon sequestration, our air quality, our health, our economy, our landscape, our ecotourism, our property values, and our quality of life. To ensure our own sustainable future, we need to keep our desert soils intact and alive . . . it benefits everyone. The choice is ours. With a Master’s Degree in biology, Robin Kobaly had a twenty-year career as a botanist with the BLM, and continues to work in botany, wildlife biology, and natural history interpretation. She is currently executive director of the SummerTree Institute, a 501(c)3 nonprofit corporation dedicated to providing responsible viewpoints toward our environment, our place in it, and our responsibility to it.